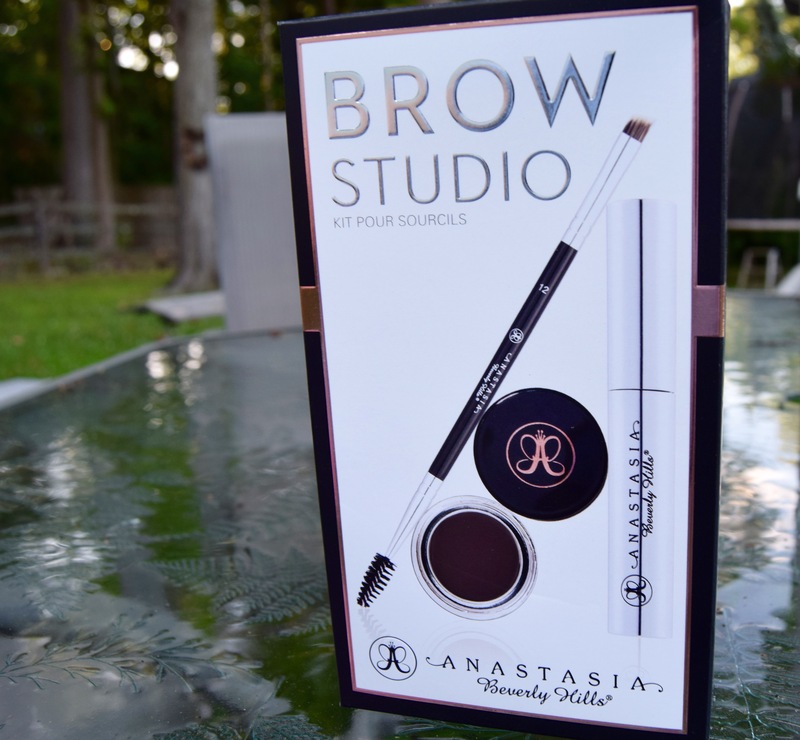 I am excited to share my first Nordstrom Anniversary purchase (this year) plus, I finally got to try Anastasia Beverly Hill’s eyebrow products. I really never needed any brow products because my natural eyebrow is big enough to shape as I like and dark enough without adding pigment. What I did need was something to keep these unruly suckers in place!! Prior to this I would occasionally use eyeshadow and a very small angled brush to shape my brows but only for special events. 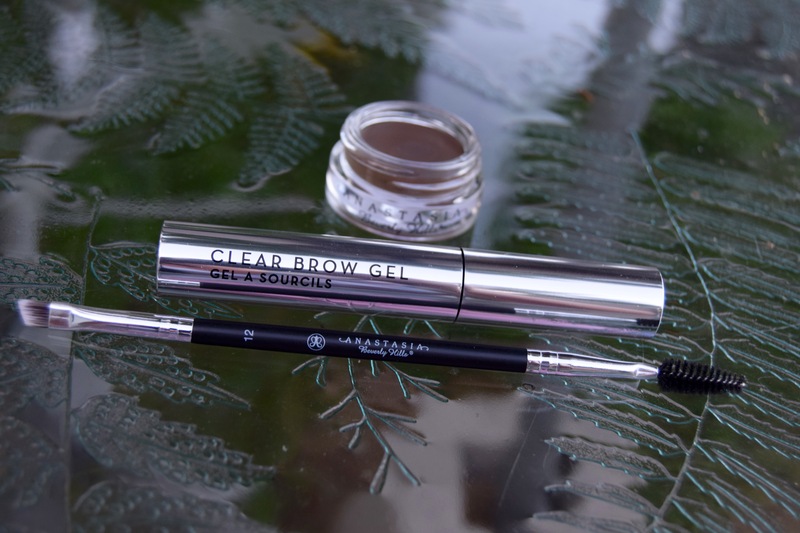 I have tried clear brow gels in the past and they were ok but if I accidentally got foundation on the brush and then into the tube…..YUCK!. I am embarrassed to say that I spray a little hairspray on an eyebrow brush, run it through my brow, and then I’m out the door. Don’t judge me. lol. One of our co-founders, (probably because she hates my routine), has been suggesting ABH for a long time….so without further adieu…. 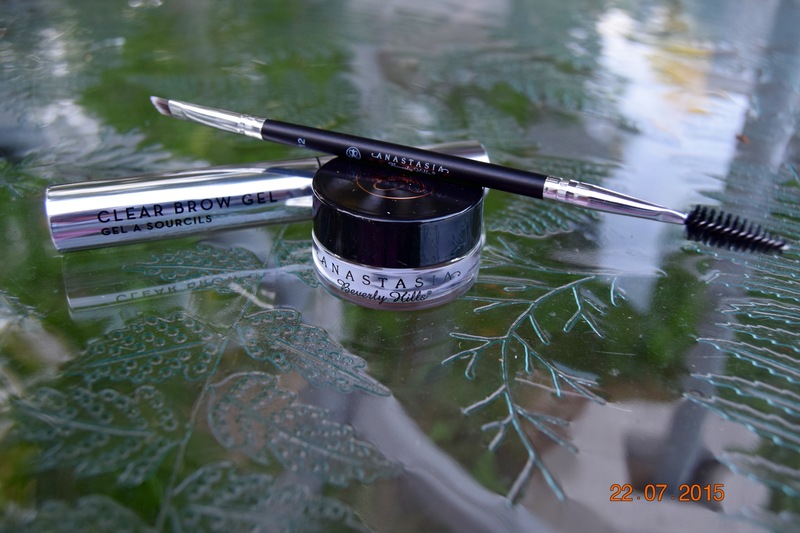 The ABH Brow Studio comes with their signature double-sided brow brush with one end being a small angled brush and the other end a spool brush, a clear brow gel in a mascara type tube with a spool brush, and Dipbrow Pomade in Dark Brown. I could tell from the first comb through that this brush was an excellent quality and worked beautifully. 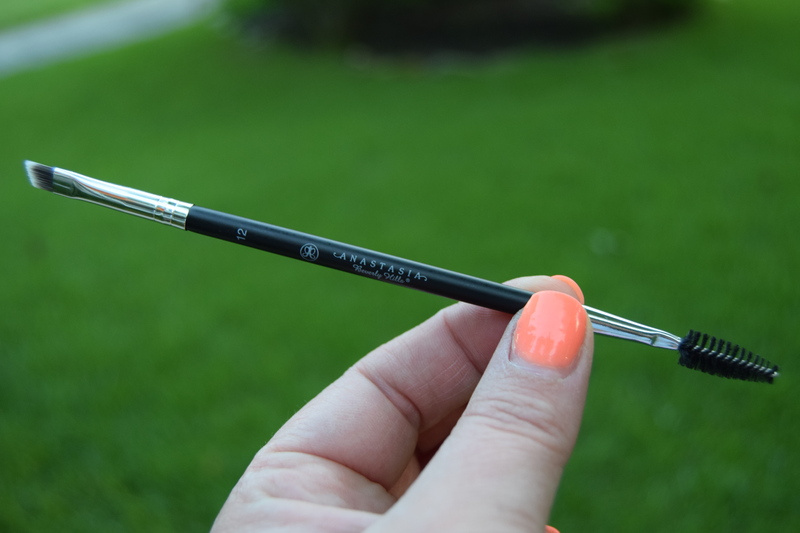 I was determined not to ruin the clear brow gel so I do not use the brush included. Instead I rub the separate brush along the gel brush and then comb through my brow. I wash the single brush after every use so the gel doesn’t get contaminated with foundation. The Dipbrow was a little tricky for me because I am really not experienced in using it. The first time I looked like I had 2 black caterpillars sitting on my forehead. lol. I quickly figured out that a little goes a long way. So far so good! I love the gel alone and I love the Dipbrow alone however I haven’t come up with a good way to use both products together. I have discontinued spraying hairspray and just use the clear brow gel on most days. I will continue to use the Dipbrow for a more dramatic look. 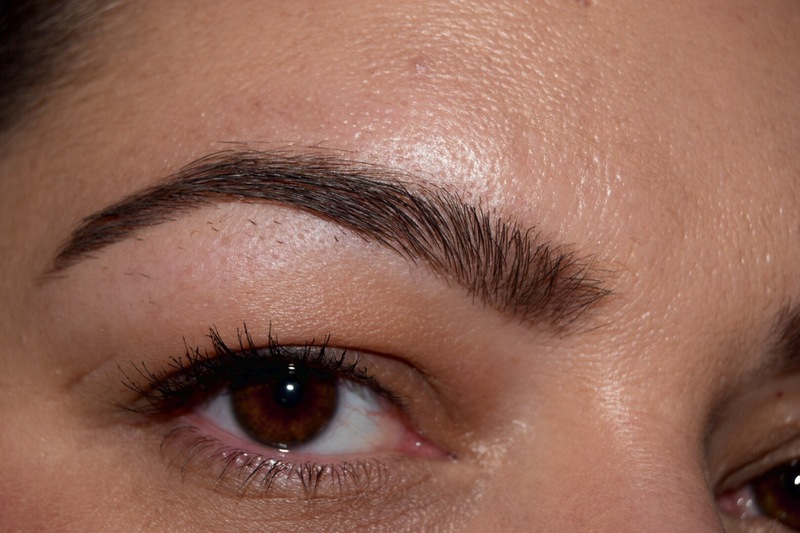 This is a photo of my brow with the Dark Brown Dipbrow Pomade. Try to overlook the fact that I have no makeup on other than mascara and I need a waxing….I apologize! I tried to swatch the Dipbrow, but because of the texture it’s not a great swatch. You can at least get an idea of what Dark Brown looks like. The Dipbrow did amaze me when smudged out it really looks like you have more hair. I would highly recommend it for anyone who has small/thin eyebrows and looking to extend /thicken your brows and it would work great to fill in any patchy areas. If you plan to purchase anything, get the double ended brush! I personally don’t know how I have lived without it. 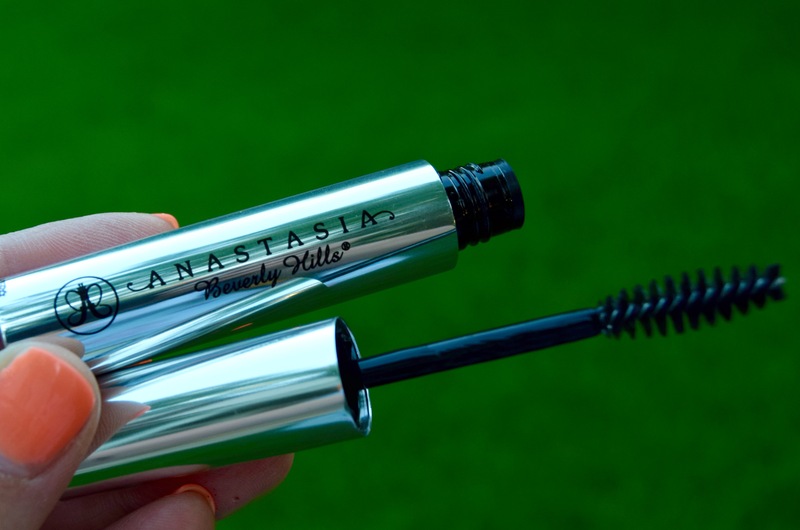 Overall ABH really is amazing!! I would love to hear how some of you have worked ABH into your eyebrow routine. As always, I appreciate any feedback or suggestions so feel free to give me some lip below. Previous What is Signature Nail Systems (SNS)? I always wanted to try the benefit brow bar. I think about it every time I’m in ulta, which is a lot. I never see anyone doing it so I always chicken out. Ok you have talked me into it. I am getting tired of driving into the city for a waxing anyway. I have sephora and Ulta 5 mins away (which is why I’m broke most of the time). Haha. Have a great day Cat!!! Hi Shay!! Yes it looks and feels like a gel liner but it dries as a powder. It is Strangely amazing. 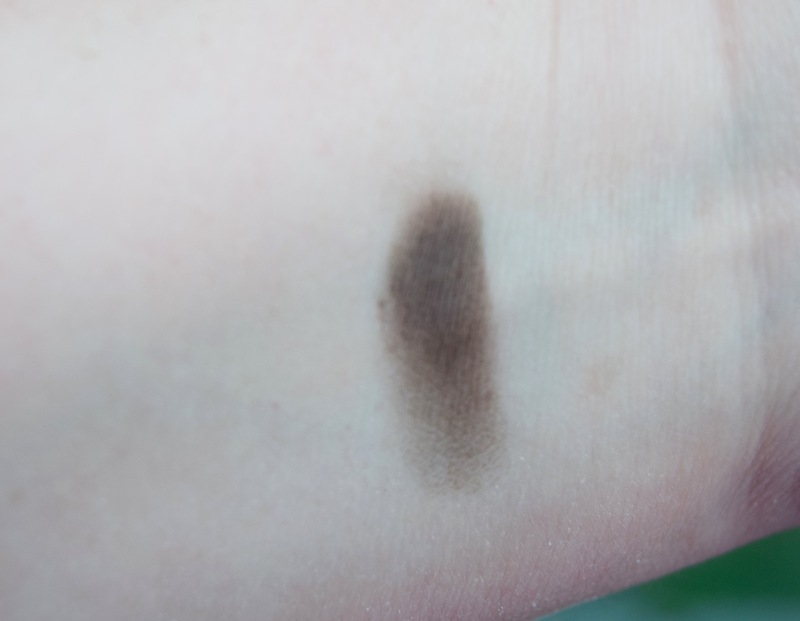 If you look at the arm swatch that was after it dried. I have tried the gel on top since this post and it worked pretty well because it hardened and stayed in place. You should try it I think it would last much longer that the powder. 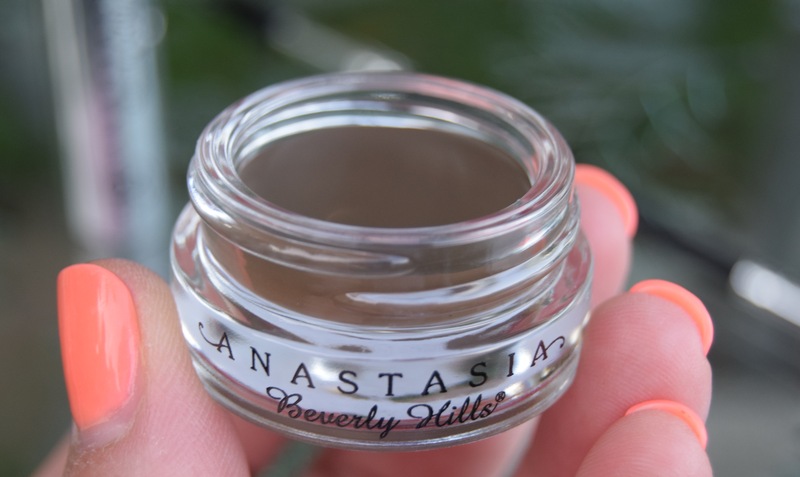 I lightly dipped once and filled my whole brow in. Thanks for reading!! Oh sorry. I worded that wrong. I mean the amount of product would last longer. I’ve never used the powder so I can’t compare wear time.